Right now, it is available from "CD Baby" as a physical CD and as a downloadable album. (They're a reputable company with good roots in the music business, so no worries.) Just click the link at the right -- or here. To my surprise, the warehouse is down to four physical copies. More will be shipped to them soon, though. But the digital downloads are always available. The process will take a few weeks, but downloads will soon also be available on iTunes and on Amazon. I'll make a quick note of that when it happens -- no more CD blog posts after this, I promise. As I said before, my goal is not to get rich, but to share my music with as many people as possible as long as I live and still remain a real dad and husband -- and person. If you like my music and spend an hour or so with headphones on, once in a while, with my songs, it will mean the world to me. What can you expect? Well, you can read an album description on the CD Baby site, but I believe, as Sting once said, that pop and rock music should be a mongrel of different styles. The Hats & Rabbits CD fits into the pop/rock genre (in the tradition of Elton John, Billy Joel or Sting), but on the CD you'll hear many influences, from jazz to orchestral, but you will never hear a song that fits a category. And I am a rock drummer, so, although there are some delicate pianistic or sweepingly orchestral songs, there's some fun with rhythm, too. To me, the best music makes you think and feel, and that is what I hope this CD does for you. I'm more serious about my music than almost everything in this world, but, though some of the tunes are serious, I'm not above writing stuff to make you smile, either. I'll stop now. Words don't do the trick when it comes to music, but if you want to check out more info, you can visit the CD Baby site and my website for lyrics, background and some info on my process. 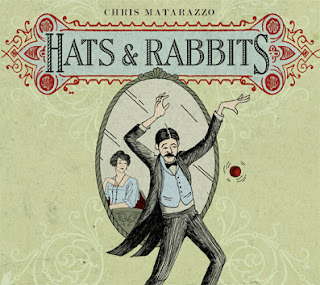 I hope the Hats & Rabbits CD means something to you. I wrote it for you, and for everyone else who does me the honor of listening. Again, thanks for your support. You have all made this blog a pleasure to write. Awesome! Congratulations on the release, and major props for all of the time and energy that went into its completion. I'm ordering the hard copy (I'm a sucker for artwork), so I'll just have to wait until it arrives before I can listen (I can be patient...sometimes). Next, those novels you've written? Thanks, Matt. I appreciate it. Yeah -- I love the CD with the packaging and all. It has a nice matte finish, too. Feels kind of old-fashioned. Haha. Yup -- I figure next I'll get a novel out, however I can. How long can a guy wait? Mr. Matt, my ears perked when I had gotten word that you had an album (I say "album" all the time, I refuse to hop on the "shiny-flat-o-thing" band wagon that all the young kids are saying) coming out and can't wait to get it and support local music. Congrats on all the hard work. Justin -- thanks a lot. It's great to hear from you. You and your brother are just "throwback" enough to still say "album". I respect that. I hope you are still making music. Thanks again!